Like bacon, garlic can make just about everything taste better—except, perhaps, cupcakes and fudge. Everything else—yes! Check out the garlic how-to tips below to ensure your use of garlic is always optimal, then go on to explore all the ways it can make your savory dishes taste just that much more yummy. You’ll find it in recipes that range from potato side dishes and crowd-pleasing dips to good and garlicky chicken dishes and even garlic-lovers’ pizza. Learn how to mince garlic, how to slice it and how to chop it to use it any way you want. 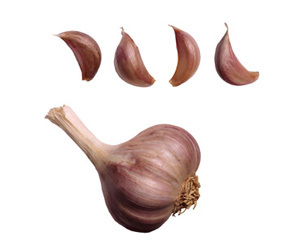 Select plump bulbs that feel heavy for their size with firm cloves and tightly fitting skin. Avoid any with soft, shriveled or sprouting cloves. Place whole bulbs in a loosely covered container with good air circulation. Store in a cool dark place for up to 2 months. To prevent the bulb from drying out, leave the papery skin intact and break off cloves as needed. Individual unpeeled cloves will keep for about 1 week. Do not store garlic in the refrigerator or it will sprout quickly and develop a bitter flavor. Garlic is usually peeled before using. To peel cloves, use the flat side of a chef’s knife to slightly crush the cloves, loosening their skins for easy removal. To quickly peel whole bulbs or a large number of cloves, blanch the garlic in boiling water for 1 minute, then plunge into cold water. The skins will slip right off. Garlic can be chopped, sliced, minced, crushed or used as whole cloves. The smaller the pieces, the more aromatic oils are released, creating stronger flavor. To prevent garlic from sticking to the knife blade, drizzle a couple drops of vegetable or olive oil over the cloves before chopping. When sautéing garlic, do not burn it or the flavor will turn bitter. To roast garlic, cut off and discard top third of garlic bulb. Drizzle 1/2 teaspoon oil over bulb; wrap in foil. Bake at 400°F for 40 minutes or until tender. Squeeze the roasted garlic pulp from the bulb, then use as directed. For one or two cloves, knowing how to mince garlic in a simple and quick way is the key to a speedy dinner prep. Peel the clove and press it with the tines of a fork! Scrape the garlic off the tines and repeat as needed. If you need to how to mince garlic in large batches, the best method is with a good chef's knife. Peel the garlic, then crush it with a flattened knife. Next, give it a rough chop. Then, with a rocking motion of the knife, chop the garlic until finely minced. Add peeled garlic cloves to the water when cooking potatoes. Mash the garlic cloves along with the potatoes for delicious garlic mashed potatoes. Toss minced fresh garlic into any stir-fry for great garlic flavor. Infuse marinades and salad dressings with garlic flavor by adding sliced, chopped or minced cloves. Purée roasted garlic in a blender or food processor and add to dips, spreads, stews, soups and sauces for sweet, mellow garlic flavor. Blend minced raw or mashed roasted garlic into softened butter to melt over vegetables, seafood and steaks or to spread on bread. Create a garlic lover’s pizza by scattering roasted cloves over the pizza before sprinkling with cheese and baking. Flavor vegetable or olive oil with garlic for stir-frying and sautéing. Add sliced garlic to the oil as it warms in the pan, being careful not to let it brown. Remove and discard the garlic before adding any other ingredients. Now that you know how to mince garlic, how to serve it and how to buy it, you'll be adding garlic to as many dishes as possible!